Test board for 4meg RAM upgrade for Atari ST MK1. All 4 banks of 256 IC's were removed and all address and data lines were soldered in their place. All lines were linked to the 4 SIMM's on the board ( 2 removed in pic ). 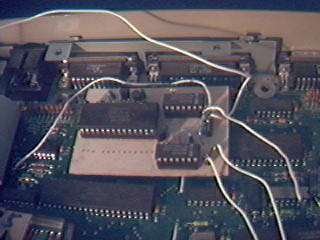 Board was designed around the STE's RAM design and converted over to the STFM's board. 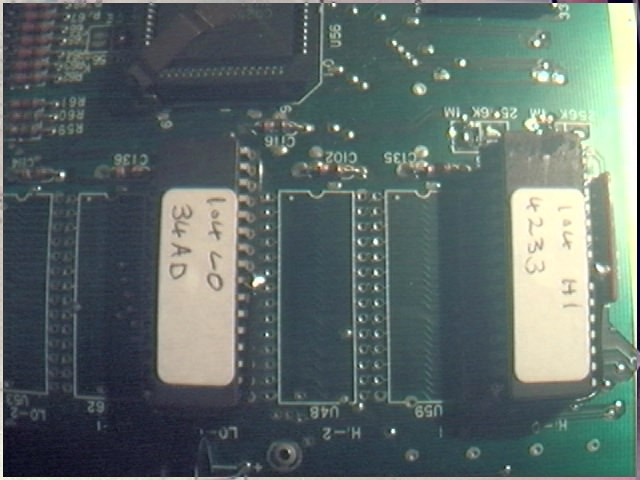 4meg was only possible since the MMU only has enough address lines for 4meg ram space. Despite this the board worked great for 4 meg. Test board for 4meg RAM upgrade for Atari ST MK2. This board is the same as the one above but built and designed better. 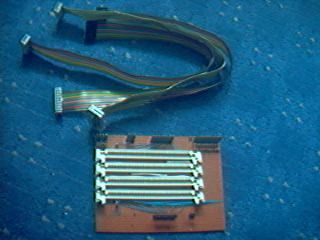 This one uses the ribbon cables to connect the board to the Video Shifter and MMU.Plug-in boards are not really possible so all these designed are solder in types. This version requires the Shifer to be removed and fitted into a socket so the cables can be fixed there. It also requires connection to the MMU which can be taken from a row of resistors near the MMU. Old RAM IC's can be left in but recommended to be removed. Image above is the proto-type 4meg 72pinn simm upgrade. A new approach for a smaller design is currently under progress. Instead of 4 30pin simms which are hard to come by, We are converting the design over to use 72pin simms which are cheaper and easier to obtain. 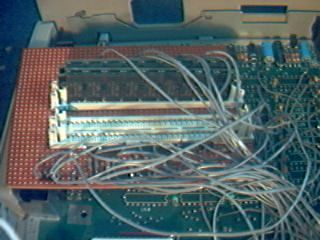 The board is planed to solder directly into the RAM area under the Atari PSU. Space is rather limited but we are confident we can fit the board there. 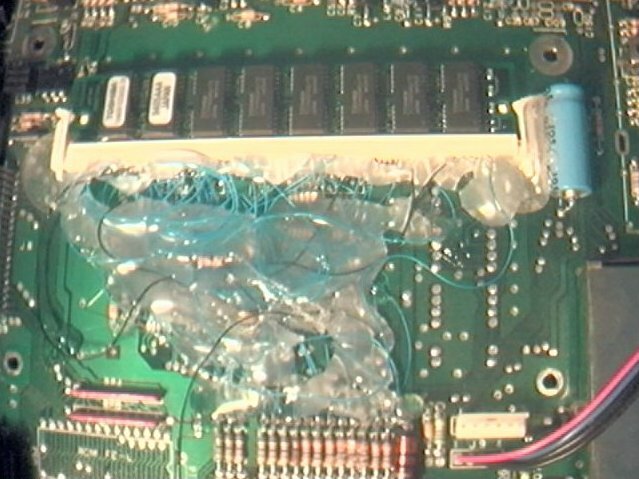 It will of course also require the current RAM IC's to be unsoldered to allow connection for the new RAM board. This design will do away with the jumper leads. 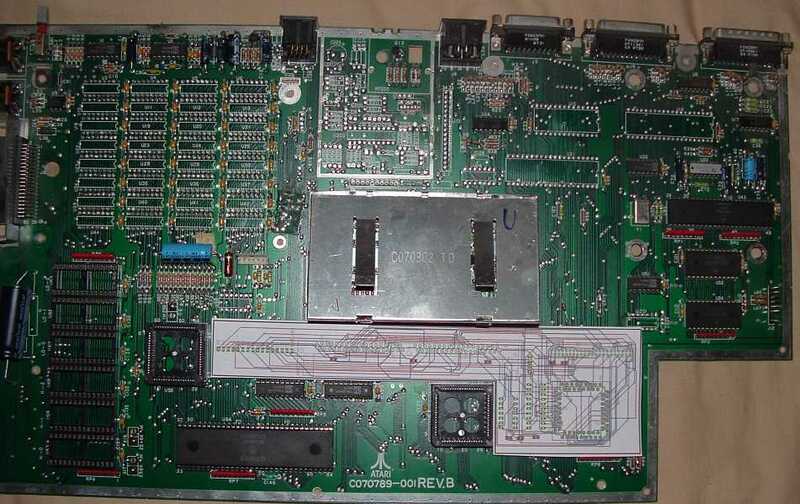 This board is a custom design for the common revision of the ST's motherboard "REV D". There are so many revisions of the board so the board will be designed for the more common types. Board is being revised to slot over the Shifter IC. PCB design is compleate for this part. Other data lines will come from near the MMU itself, this extra adapter is under design. There are currently no pre-orders for this board so development is on hold for now. Test board for 1.44meg floppy drives MK1. Should have allowed the internal 720K drive to be replaced with a 1.44meg drive. Despite best efforts the board failed to work correctly. Test board for 1.44meg floppy drives MK2. After a rethink the board was rebuilt with a new approach to the problem. This board does not require any software in order to function with 720/1.44 drives. 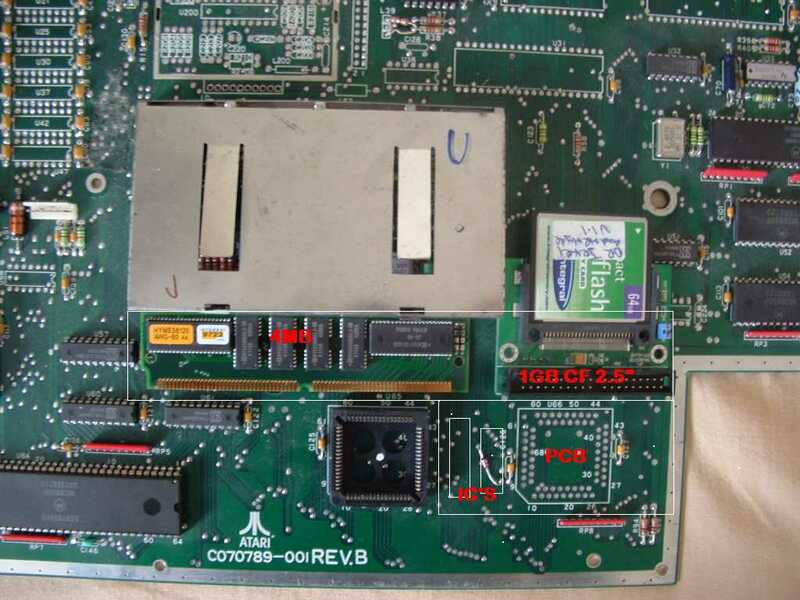 The board shown works for internal drives only. It is possible to still use a 1.44meg external but not without problems. These will be corrected on the next version. Built and working on 12/7/02. Rev 7 of this board includes lots of minor tweaks in the design and layout. Approx. build cost £40 inc drive. Preview of fitting instructions comming soon! Click HERE for ST dismantle instructions. Test board for 1.44meg floppy drives MK3. This new board requires a little more "logic" to function with no limitations. Currently involved 2 IC's like MK2 version ( not including the floppy controller ). It will support both internal and external drives, both 720K & 1.44meg. It will also be possible to copy to and from 720K to 1.44meg drives with no problems. The board is fully automatic and like the MK2 version requires no software for it to function. It is possible to build a board with a little less logic by using software though we wanted a fully automatic design with "No fuss" involved. Once fitted you can forget about it. Like the MK1 & MK2 design, the floppy controller is removed and fitted into the adapter board. The adapter board is then fitted to the ST motherboard. Some kits require you to cut and bend legs to fit, Nasty!. 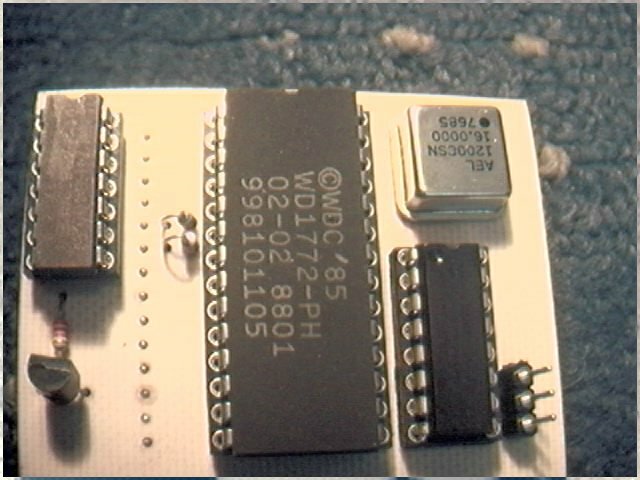 Its best to removed the WD1772 ( floppy controller ) altogether and fit it into the adapter board. The PCB is made by ourselves and thus ensures a cost effective solution. 3 wires on this board only to solder. White is drive 0/1 select. Orange is drive 0 HD select. Black is drive 1 HD select. Double transfer speed for 1.44 discs. Quality turnpin gold plated sockets. Cheaper than most other designs. No messy track cutting involved. Fits via external floppy port on the ST to give a 1.44meg drive. This drive is intended to be used with the 1.44meg floppy kit above. Simply plugging in a 1.44drive will not work. 720K drives are available on request. Drives are high quality Sony/Teac brands fitted in a attractive aluminum case with black trims on the front and back. 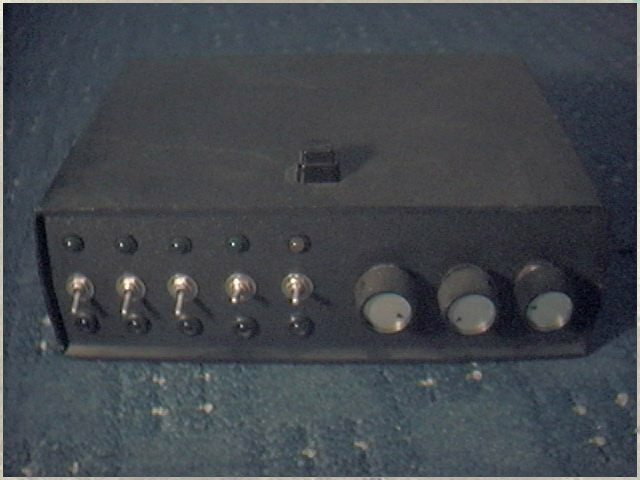 The back panel has the floppy lead and a 5VDC power connector for the power supply. The supply is a wall PSU 5volts 1amp rated. Build approx cost £80. We will build this drive for anyone who is interested. Built around 1990 and one of out very first projects. We got a bit bored with the normal "auto fire" on the joysticks since we used to play super cars a lot back then. Supercars used Fire for the break and forward and back to fire weapons. So the "Auto Flobber" was born. This allowed Up,Down,Left,Right,fire to be automated at what ever speed you wanted. 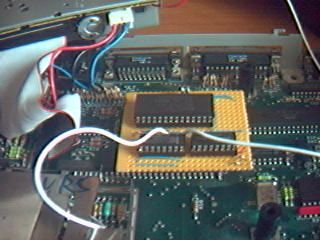 Atari ST TOS to Eprom conversion. 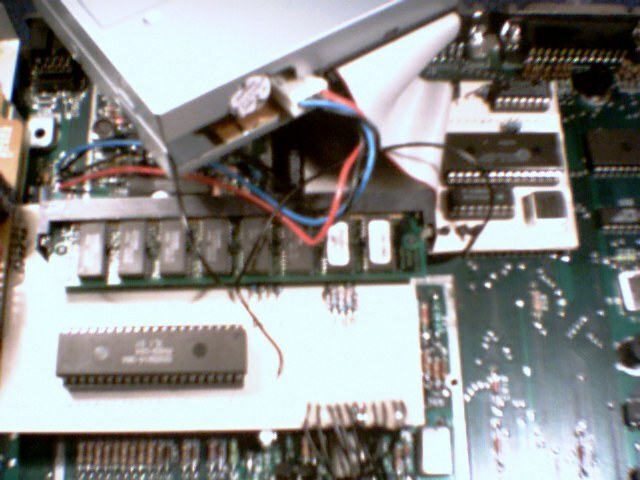 Its also very possible I may blow some eproms with 2 or more versions of TOS at a latter date. Latest update to the RAM board. The Shifter was removed and the board soldered in its place. The shifter being placed in the boards socket. The wires comming from the bottom of the board run off to the MMU. Soon I will build a new revision so the PCB will also solder to the MMU to save on the wires. This will fit only this style of motherboard layout, REV C,D,E is the most probable. The board *just* fits under the metal case sheild. I also may add in some Eprom sockets since chopping eproms to change the TOS each time is getting a bit long winded. A simple change of eprom sounds a lot easier solution. The board on the top right is the HD1.44 controller. The project was to revamp the simm adapter to plug into the blitter socket. This would offer a way to upgrade the STFM memory to 1MB or 4MB. Also there was a option to add internal IDE for CF card support.